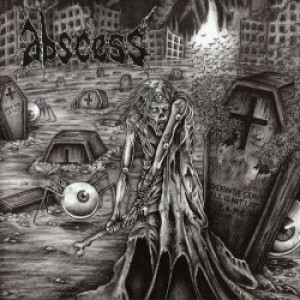 Abscess hail from Oakland California and started life in 1994, with the band going on to gain the suitable description of ‘Sickodelic Gore Metal’. Chris Reifert & Danny Coralles are both founder members of late 80’s/early 90’s gore metal band Autopsy, who were signed to Peaceville for 4 albums in the early 90’s. Chris also started his career in the 80’s with the highly influential extreme metal band Death. 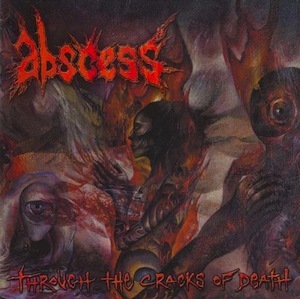 Abscess hail from Oakland California and started life in 1994, with the band going on to gain the suitable description of ‘Sickodelic Gore Metal’. Chris also started his career in the 80’s with the highly influential extreme metal band Death. The first commercial offering from Abscess was a collection of their early demo’s, released as the album ‘Urine Junkies’ on Relapse Records in 1995, causing controversy with the cover depicting someone ‘shooting up’ urine from a syringe. After the resounding success of ‘Urine Junkies’, the band release their second album for Relapse in 1996, entitled ‘Seminal Vampires & Maggotmen’. 1997 saw the band record their last record for Relapse, the EP ‘Throbbing Black Werebeast’. After many more demos the band signed to French label Listenable Records in 1999, and released the album ‘Tormented’. This was followed in 2001 with a split 10” with Swedish band ‘Deranged’ containing 3 tracks from the Tormented session. A split CD with Spain’s ‘Machetazo’ quickly followed and was released on Ironia/Upground Records. In 2002 Abscess signed to Peaceville Records and recorded the album ‘Through The Cracks Of Death’ at Different Fur Recording Studios in San Francisco. The band already being very familiar with the studio as they recorded the seminal Autopsy album ‘Mental Funeral’ there in 1990. ‘Through the Cracks of Death’ was finally released in September 2002 on Peaceville to great critical acclaim. Abscess then continued their already impressive recording career with the ‘Damned & Mummified CD in 2004 on US label Red Stream. The Darkthrone guys had been long-time fans of both Abscess and Autopsy and thought that the band would suit the attitude and mentality of their new Tyrant Syndicate label perfectly, so in early 2006 a deal was completed and work swiftly began on the new album and seventh full-length release, ‘Horrorhammer’. ‘Horrorhammer’ was recorded in late June 2006, featuring 12 tracks of filthy punk fuelled death. It was recorded by long time cohort Adam Munoz at Prairie Sun Studios, where Possessed recorded the classic ‘Seven Churches’ album, & released in 2007. 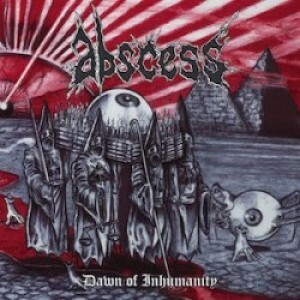 It wasn’t until late 2009 that Abscess recorded their follow-up album, a worthy release to mark the closing chapter of Tyrant Syndicate productions. The year had already gone well for the band, with a successful gig at the famous Maryland Death fest preparing the band well for the recording session at Fantasy Studios, CA, with Adam Munoz once again. The outcome, ‘Dawn of Inhumanity’ is a twisted concoction of doom, death & punk, with artwork by Dennis Dread (notable for his work with both Abscess & Darkthrone) & guest vocal appearances by the Darkthrone guys. The album is set for release March 2010.